The General Data Protection Regulation, is a piece of legislation that was approved and put in to place by the European Parliament in April 2016. As European Law, it will fully take effect after a 2-year transition ending May 25th 2018. GDPR, replaces the previous Data Protection Directive (DPD), adopted in 1995, and will in the UK, replace and strengthen the Data Protection Act 1998 (DPA). One of the initial differences between GDPR and DPD, is that GDPR is a regulation not a directive; as a regulation, no additional enabling legislation will have to be passed by governments of member states. 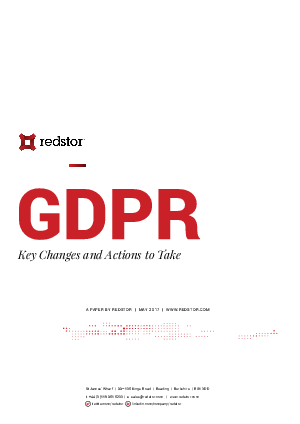 Redstor have the ability to give insight into the data organisations have on their networks, advise on best practice to protect data and then implement strategies around backup, archiving and disaster recovery. Data is searchable through an intuitive console making compliance simple and achievable for all organisations protecting data through the Backup Pro Platform.